Ohhh another Oden’s arrived on my doorstep yesterday, full of Oden awesomeness! 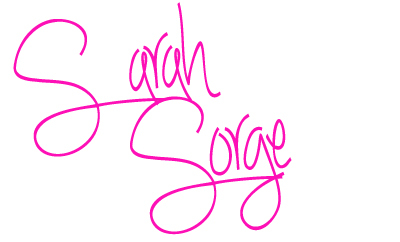 My change of heart for this brand has been miraculous and I find myself being just as excited over this as any of my usual favorites. 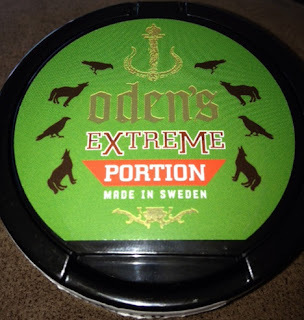 I thoroughly enjoyed the Oden’s licorice I got last time, the flavor was intense and the best tasting Anise snus I have ever tasted. This time, its Wintergreen, a woodsy ingredient made popular by American tobacco and candy manufacturers. I had high expectations for this one. A bright olive green packaging with the funky oden’s design and a “caution: it can blow your mind” in big bold writing! Haha, that’s all relative I suppose. I asked my boyfriend (who does not use any kind of tobacco) to smell the can and he described it as walking into the pine forest and sticking your face into the dirt. That’s actually a compliment really, a fresh earthy fragrance reminiscent of pine and wet tobacco, a combination I find very pleasant and appealing. I believe all snus should have a natural earthy aroma, being that it is the most minimally processed, this is a real and natural product. As a huge fan of jakobssons flavoring, I was expecting oden’s to have the same bold wintergreen’s punch, but it doesn’t. It doesn’t really taste of anything. I have rolled several portions around in my mouth and cannot taste anything except a mild tobacco flavor with a hint of something very faint, maybe of a creamy vanilla. 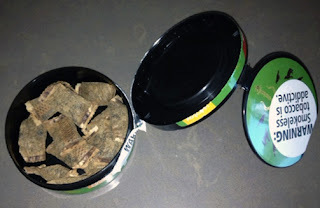 At first I was really disappointed, I have come to love the harsh herbal taste of wintergreen, but then I got to thinking, some people don’t like strong flavored snus like Jakobsson's and Thunder, and that’s ok. Swedish Match makes many products don’t really taste much like anything in particular and they are very popular and successful. That’s the great part about these reviews; you can learn what brands are heavily flavored and what brands aren’t. The pouches are also very comfortable. They are a wet portion and kind of lump up in the middle. I like to squish it around in my fingers first to distribute the tobacco and get the juices flowing. Now the really cool thing about this snus is that the nicotine level is 22mg! Amazing, especially considering there is no harshness. I didn’t even know it was that strong until I looked it up on Northerner. With other strong brands I sometimes get a jittery/heart-racing feeling, but not with Oden’s. I really like them for that; it must be more of a slow released nicotine additive. Much better than the instant hit/release into the bloodstream that is sometimes nauseating. I personally wouldn’t buy this snus. The Nicotine level is great but I prefer my portions to be flavored. I mainly use portions when I am out and about and prefer interesting flavors, something to keep my mind and mouth occupied for long sittings in LA traffic, I will stick to my oden’s licorice for that. I would recommend it to those who prefer a mild portion and big nicotine hit. I know you are out there! 1 comment on "Oden's Extreme Wintergreen Review"